Ed Christman was born with genuine curiosity for any new person — grocery cashier, taxi driver, long-distance phone operator, fellow restaurant diner, or college freshman — asking “what’s your name? what are you doing? what’s it like to do your job?” Ed’s friendliness created the initial bonds between him and each new crop of Wake Forest faculty, staff, and students. Ed had friends on every corner of the campus. 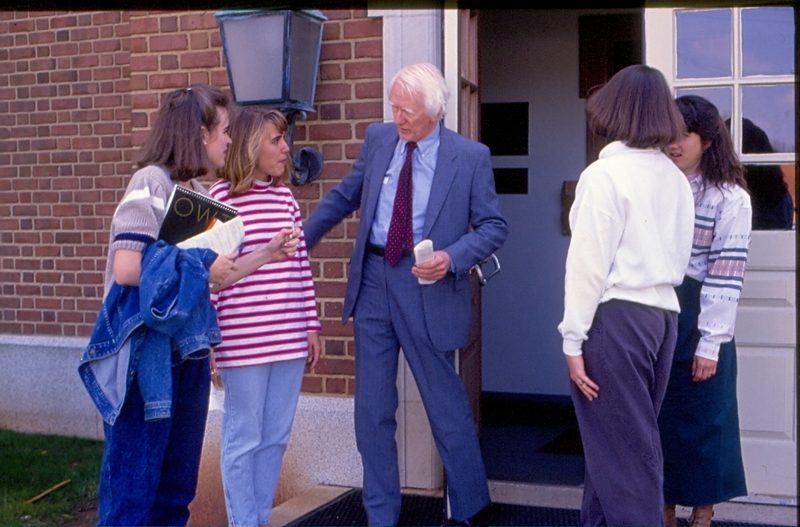 Among his best friends were his fellow campus ministers and his neighbors in Wingate Hall from the WFB Church, the Religion Department and later from the Divinity School. 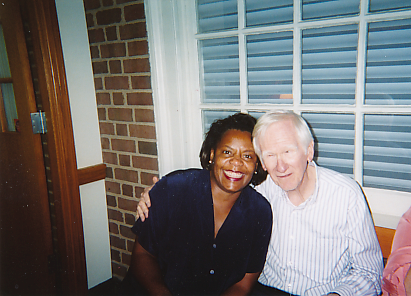 Chaplain Ed Christman and Religion Department Professor Valerie Cooper at the 2003 reception prior to his retirement. Ed and Jean always lived on the campus. In the 1950s and 1960s, they lived in the faculty apartments, and in 1972, they moved to the faculty neighborhood of Royall Drive. They were always blessed with fine neighbors. The faculty apartment community was right next to the campus. It consisted of ten brick buildings with two and three bedroom apartments. In the 1960s, the apartments were a vibrant and intellectually stimulating place created by the presence of many young families just starting their careers. Wake Forest was growing, and the apartments were home to many new faculty. There were regular bridge games, dinners together, and a few gatherings that turned into all-night conversations. The apartments had generous outdoor space for young children to play, and the easy walking distance meant that students could easily come to visit. The faculty apartments were also home to retired Wake Forest faculty and staff, some of whom became dear friends, especially the families of Vera and Janelle Brown and Mr. and Mrs. Frank Hasty. These apartments were, at the time, an affordable and supportive multi-generational community that was also the very best place for Halloween trick-or-treating. In 1972, the Christmans moved to Royall Drive, a newly-developed neighborhood behind the University’s Faculty Drive. Jean, Ed, Kim and Carolyn at the front of brand new 2120 Royall Drive in 1972. They lived on Royall for 37 years, and savored the quiet beauty and deep friendships among the neighbors, the Barnetts, Sheilds, Seelbinders, Schoonmakers, Milners, Wadills, and many others. This street was another lively collection of Wake Foresters who enjoyed living near the campus and the fellowship with one another. Then there were the students. Many of Ed and Jean’s strongest student friendships were made through the Baptist Student Union (BSU) group. Ed and Jean regularly attended BSU meetings and events, and they hosted events at their house, within walking distance of the dorms. 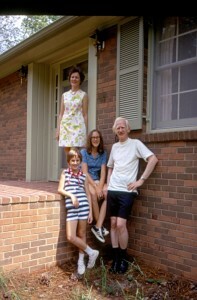 Ed was also an undergraduate student adviser for many years, and this group also visited at the house. The often-served menu was ‘Houston Hash,’ salad, and fudge. But really, all students were friends. Ed with students outside Davis Chapel, where weekly services were held. Anne Atkins: “I am delighted to have the opportunity to tell my favorite story about Ed. In October 1977 I became a staff member of the Wake Forest News Bureau, green to the inner workings of a university and not knowing exactly how I was going to fit in. “I think I fell in love with the spirit of Ed that day, and later when I had the good fortune to meet Jean, I found her spirit to be as contagious as his. The rest of this story continues. Richard Mallory: “Ed provided presence, affirmation and trustworthy support in my undergraduate experience. He was a central figure for helping me sort through personal and vocational challenges. He helped me to begin to see myself as worthwhile as a young adult. “College is a journey not a destination. It is filled with choices like a cafeteria. College is alive with opinions and exaggerations of what others have accomplished in high school. “Listen to peers but do not be overly impressed. You deserve to be here, and you can choose what will nourish you and avoid what is harmful. “Challenge yourself to heed what the Bible says – ‘be still and know that I am God,’ because to listen to your head and heart, you have to avoid the rat race. “Buy some Wake Forest postcards; address them to yourself; or send them to family and friends at home along with a brief letter about what’s going on in this different place with people, some of whom are different from anyone you have ever met. “Continue to exercise your mind and spirit by checking out one or more religious groups, including weekly chapel at 11AM Thursdays. Religion provides strength and a sense of community as well as an avenue of service to others in Winston-Salem and countless places in the world. “Joggers will be delighted with the trails, especially those in Reynolda Gardens which also includes a health food store and an incredible milk shake! There are on campus places to exercise, read newspapers, view magnificent art and listen to music. Bring your own music and be prepared to hear others’ preferences. “Explore Winston-Salem and its surroundings beginning with Reynolda House within walking distance. See your journey here as a sacred gift by which you are nourished and nourish others. See this journey as a mile run – one lap, one year at a time, part of which may be spent in an overseas program. “There is something called the ‘all-nighter’ for writing a paper or studying for quizzes. It sounds almost romantic. It may be necessary, but not often. Remember those who rely too much on such experiences are like the three point shooters – even the best of them hit less than 50%. Ed and Jean made friends because they spent the time doing it. They have always loved doing business on the campus quad between Wait Chapel and Reynolda Hall — bank, post office, and bookstore. In recent years, the bookstore, now a coffee shop, was their favorite place. Ed says that his best retirement honor was the Lifetime Coffee Card awarded to him by the bookstore in 2003. Numerous campus friendships were nurtured over coffee, while sitting on the quad watching the world of Wake Forest walk by. Ed and Jean have made many new friends at Salemtowne Retirement Community. As at Wake Forest, they reach out to fellow residents, to staff, and to visitors alike. And, like at Wake Forest, they have made friends over coffee, at Salemtowne’s morning coffee circle. Add your comments to the bottom of any page. Comments are moderated and may take a day to post. Send your stories by email. Copyright © Ed and Jean Christman.